Numerous romantic castles and fortresses have been built along the banks of the Rhine between Cologne and Mainz and they have many exciting stories to tell. The UNESCO World Heritage Site Upper Middle Rhine Valley is rich in tales and adventures and it is very beautiful. The Rhine in this area pushes its way through rocks and passes towns like Koblenz, which are over 2000 years old and have old towns with many timber framed houses. This is the ideal landscape for a beautiful and relaxing holiday. Last but not least many of these towns between Cologne and Mainz are home to some noble wines and regional delicacies, which make this journey also a culinary one. Individual arrival to Cologne and Embarkation between 3 and 5 pm. Enjoy the evening on board or with a Kölsch beer in one of the pubs with a view over the river Rhine. Before starting your first cycle tour, take the opportunity to stroll through the Old Town. Afterwards you start your first cycling tour to the city of Beethoven, Bonn. This federal city and former capital of Germany still has international flair. On your way it is worthwhile to visit the leisure island Groov amidst a vast landscape of the Rheinaue wetland in the Cologne suburb Porz-Zündorf. In Bonn there are museums like the House of History or the Bundeskunsthalle courting for visitors’ attention and the House of Beethoven, the Rheinaue as well as the Bundesviertel with the path of Democracy are equally worth a visit. You will continue towards Andernach by bike today. Königswinter with its castle Drachenburg on the Drachenfels (steep ascent) as well as the Sea Life with aquariums for more than 6.000 sea inhabitants is worth a visit. Your destination for today, Andernach, is famous for the world´s biggest cold water gush spring with its impressive fountain of 60 m.
On your way to Koblenz you will find castle Engers in Neuwied. At the famous “Deutsche Eck” (german corner) the river Mosel merges with the river Rhine. Another place of interest is the fortress Ehrenbreitstein which you can also reach by cableway across the Rhine in Koblenz. Tickets for the cableway are available on board. You continue your journey by bike up the river Rhine through the UNESCO world heritage site Upper Middle Rhine Valley. You will pass the romantic fortress Marksburg, the only hilltop castle of middle Rhine which has never been destroyed, as well as the city Boppard with its fortress Kurfürstliche Burg, before you will reach St. Goar. Here you will find the ruins of fortress Rheinfels, which is the biggest of its kind along the Rhine. The fortresses Katz und Maus (cat and mouse) in St. Goarshausen on the other side of the Rhine are also worth visiting. Again you will pass very beautiful Rhine castles like Burg Reichenstein and Burg Rheinstein. 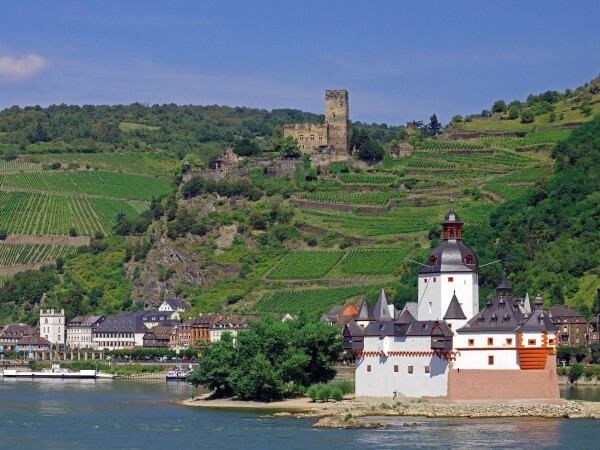 You will cycle past the famous rock Loreley before you reach Rüdesheim. In Rüdesheim we recommend a city walk around the historical town with its beautiful half-timbered houses. Or treat yourself to a ride on the cable car up to the Nie-derwald monument. Here you will have a beautiful view over the old town of Rüdesheim and the river. On your final cycling stage you will find the Rhine at its best. The city Eltville am Rhein with its emblem, the castle Kurfürstliche Burg, is on your way. Mainz, your destination of today, presents itself with numerous impressive buildings. You may want to visit its cathedral Hoher Dom St. Martin, one of the proud imperial cathedrals of Germany, or the castle Kurfürstliches Schloss. In the old town you will find attractive alleys and squares like the Augustinerstraße and the Kirschgarten with its lovely timber framed houses and wine restaurants. Disembarkation after breakfast until 9:00am. The quality of the cycle ways along this route is excellent. Most of the way is paved or asphalted and does not have any gradients of note. This makes the trip suitable even for unpractised cyclists. We recommend flying to Cologne airport to reach the starting point of this cycling holiday. The Bike & Barge: Cologne to Mainz cycling holiday includes accommodation on-board the MS Arkona and local support if required. Journey to Cologne and from Mainz, shuttles, entrance fees and excursions, bike rental, ferry fares, travel insurances, parking fee, drinks on board, tips. The MS Arkona is being completely refurbished during the winter of 2017/2018. The modern and elegant atmosphere aboard the vessel will make your journey a relaxed experience. The Upper deck holds the tastefully furbished saloon with bar and a bright and friendly restaurant. The spacious sun deck is partly shaded and features comfortable deck chairs, which invite the passengers to enjoy the passing scenery in relaxation. Both the Upper and the Main deck hold comfortable cabins of 11 m², furnished in a modern way. All cabins feature hotel-style beds, en-suite facilities with shower and hair dryer, TV, safe and individually controlled air conditioning. Upper deck: twelve two-bed-cabins with sliding glass doors and French balcony (= room high window, the upper part of the window is to open) and two one-bed-cabins with a small double bed (140cm) and opening panoramic windows. Main deck: 34 two-bed cabins with non-opening windows. Technical details: Length: 83,03m • Width 9,64m • Depth 1,30m • Max. 96 passengers. • Languages on board: German, English • Currency on board: Euro • Credit cards: MasterCard and Visa.